The End of Reading: From Gutenberg to Grand Theft Auto is titled provocatively to address current debates about American education, intelligence, and the rise of popular culture. By focusing on “reading” the book addresses the crisis in public literacy, but chooses not to blame the familiar scapegoats of non-English-speaking immigrants and popular culture. Instead, The End of Reading argues that in a democratic, multicultural, and technologically-sophisticated society, we need to embrace multiple definitions of what it means to be a literate person. These new definitions of literacy require a more intensely interdisciplinary approach to “reading” the world, which recognize differences in the origins, forms, contexts, and cognitive processes of expression and reception. Getting at these definitions requires us to look beyond established paradigms of “media literacy” and “cultural studies”––though these remain crucial––and examine the sources of language, the field of perception, and the history of visual expression. Put another way, this mean looking past fields of education and media studies to also consider recent scholarship in anthropology, art history, linguistics, and psychology, among other areas. The End of Reading: From Gutenberg to Grand Theft Auto also seeks to expand discussions of literacy itself by situating its discussions in broader terms of language and vision. The End of Reading explores the historical origins of language as well as ways that people develop language abilities in childhood. The book similarly looks at humanity’s earliest non-linguistic picture and art-making inclinations and traces their parallel development with speaking and writing. 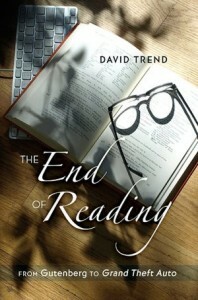 In tracing these trajectories to the present day, the book doesn’t propose the “end of reading” so much as it advocates a more inclusive and stridently interdisciplinary view of literacy as we know it. In doing so, the book offers a diverse approach to literacy compatible with evolving discourses in technology, multiculturalism, gender and disability studies. In personal terms, The End of Reading is informed by the struggles with reading of my nine-year old child. I continue to wonder how kids are going to do in a world that requires reading while increasingly making it seem irrelevant. Each chapter begins with an anecdote about early reading difficulties.